Vertical alignment of blocks is difficult in other cases. See this article for more details. I am opening the source of a small project that I made for a charity organisation http://evpomembers.codeplex.com. along with EVPO Members. If not, see http://www.gnu.org/licenses. Download the source from the SVN repository. Run apsnet_regsql from Visual Studio command line and install aspnetdb. Leave default settings mostly in the wizard. 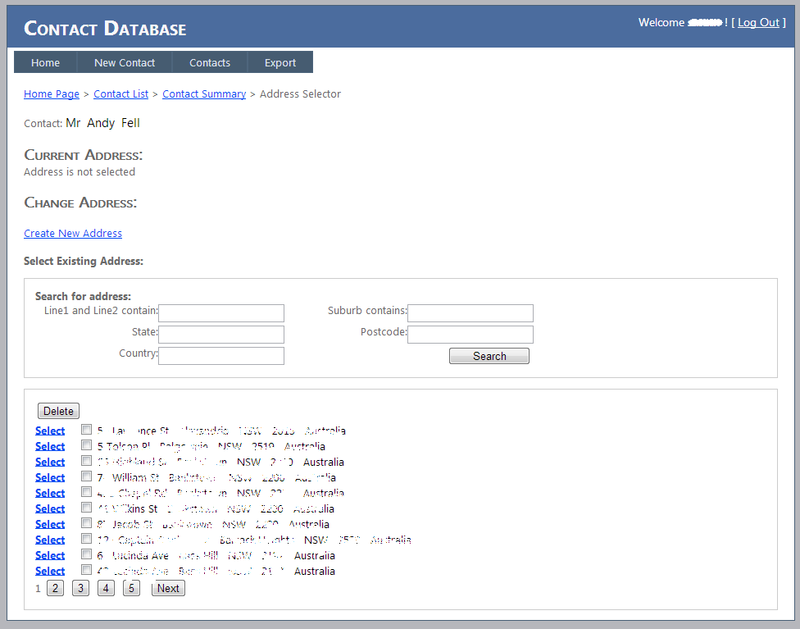 Create a SQL log-in (ContactDataUser for example with password 1). 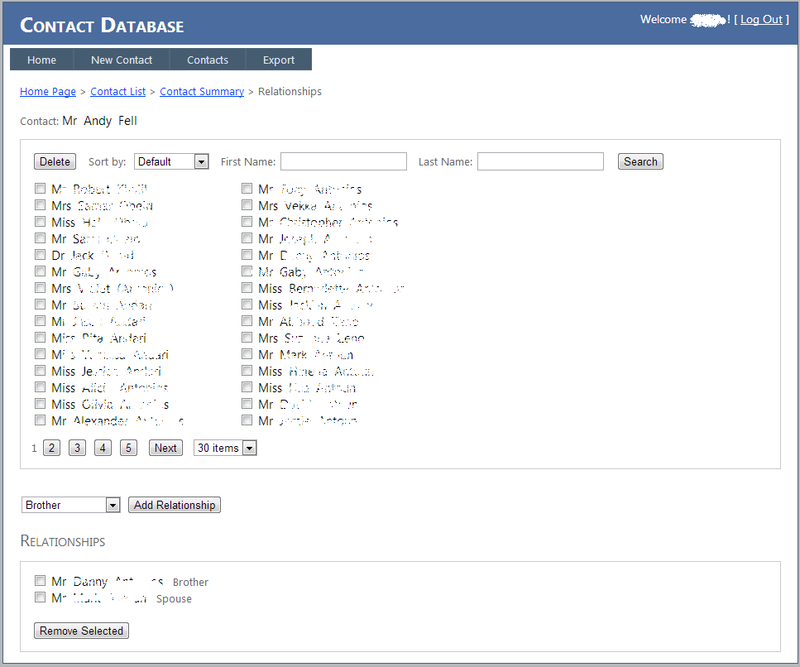 Grant access to the log-in to the ContactData and aspnetdb databases. Download AjaxControlToolkit (http://ajaxcontroltoolkit.codeplex.com/,go to All Downloads and download the package for .NET 3.5 !!!) for .NET 3.5 and unzip it to the AjaxControlToolkit directory. Open the solution and rebuild it. Update the two connection strings making them valid for the ContactData and aspnetdb databases respectively. The picture above is the solution in VS. The application contains three layers: Data Layer, Business Layer and UI. The Resources folder contains the scripts run during the installation. 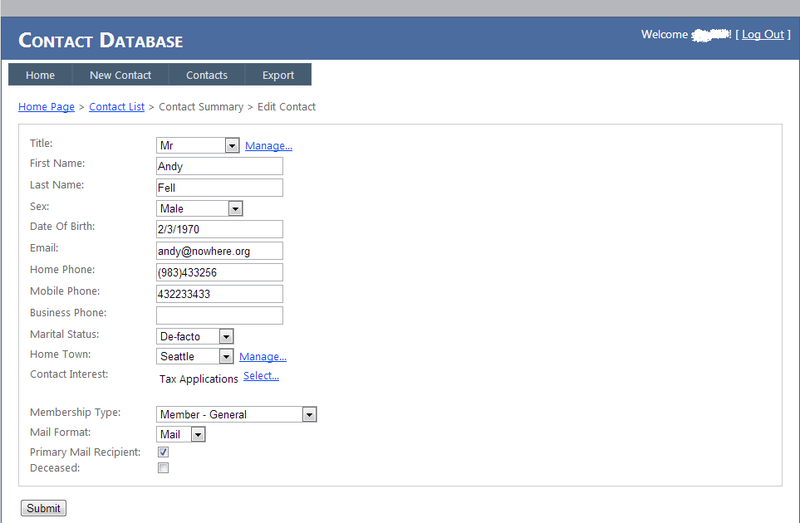 CreateDatabase creates a new database and all the schema objects. In addition it populates some tables. CreateUsers creates users needed for working with the database. It is run once at setup time as well. The purpose of the files with Access suffix is to access the database and change its state or obtain business objects from it. In this application business objects are simple and their purpose is only to store data. They don’t do anything. Access suffixed classes work with them. They load and save them from the database. Besides, access objects run queries and change the database state. 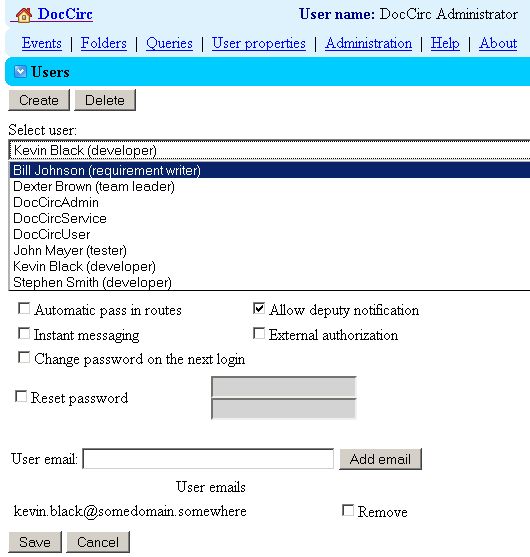 For example DocCardAccess loads and saves DocCardItem from the database. DocCardItem is the business object representing Document Card. This is the project that all other projects reference. Mostly it contains data storage classes like buisiness objects, global settings and so on. Most classes do not do anything, just store data. The project have common classes that all the layers operate with. For example, DocCardItem class mentioned above is loaded from the database in the data layer and can be processed in the business layer. Then DocCardItem objects are displayed in the UI. The business layer. It contains all the business logic. It also serves as an intermediate layer between the Data Layer and UI because, as I said above, UI cannot access Data Layer directly. Classes with suffix Data are wrappers providing access to the data layer. An important class in this project is DocCardMovementController. It provides workflow control such as moves the document card to the next stage. The classes in this project comprise the UI layer. Originaly the code in the classes was extracted from asp.net web pages for unit testing, but now I think it is a good idea to move as much as possible from the web pages because they must be as thin as possible and they are not covered by the unit tests. As you see in the picture, it’s purpose is to compose and send notification messages such as Action Is Required or event notifications to the users. There are two ways of notification Email messages and instant messages. EmailMessanger and InstantMessanger are for those purposes accordingly. Note that InstantMessager doesn’t send notifications by itself. Instead, it accesses a web service specified in the configuration that sends the actual notification to the users. The web service is not included in this solution. It contains the web pages. The project references Common, Biz, UI and resources. “G” folder contains pictures that are used in the UI. The “Settings” folder stores configuration files e. g. evpodc.config. The most important file in the project is AppCode\Global.asax.cs. Inside this file the action starts. It is worth starting from for developers who study the application. Note that the web pages don’t contain language specific data. The words and sentences are stored in the satelite resource assemblies Evpo.DocCirc.Resources and Evpo.DocCirc.Resources.ru-RU. Their description follows. Each web page file has a resource file in this project. There are two assemblies at the moment: english and russian. They are used depending on the culture of the project set in web.config. Other languages can be added. 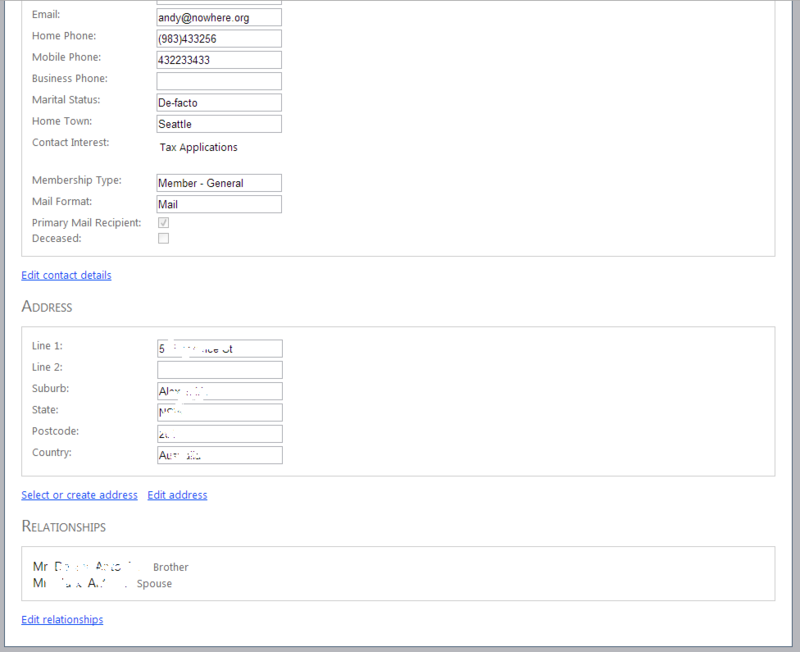 When you first enter the application, you see the Queries menu (Figure 1). However it’s too early for making queries because we don’t have data yet. For the working system we need to create users, folders and routes. Then we’ll be able to create documents. To create users we click Administration, then Users. We see that there are three existing users. They are builtin users. Don’t delete them. Unfortunately, the system allows you to delete anyone. Although the application behavior is unpredictable if you do so. You might be asking: where are the permissions? The answer is that it’s too early for permissions. You confugure them for each folder and document type and we haven’t created neither. That’s what we are going to do now. This interface is easy to understand. When you input Folder Name and click Create New Folder, a subfolder is added in the folder that is selected on the left. For our scenario I create a complex folder structure (see figure 4) for the purposes of our sample. Now you see where permissions are. These are default permissions for Development Team folder. I assume I need to give you a clue about security settings in the app because it’s flexible but not clear at first sight. The security system is similar to the NTFS folder security and other known applications. Each security object, a folder in this case, has security settings for many security roles. 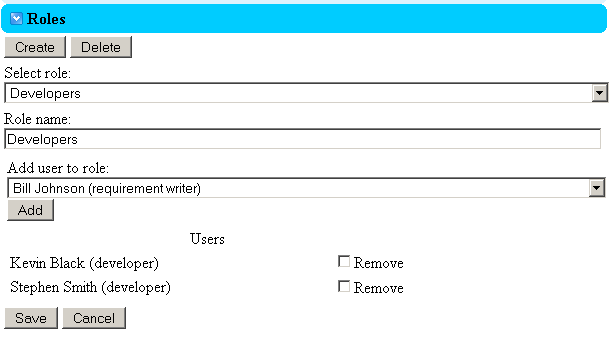 In figure 5 we have settings for Administrators and Users because they are builtin roles. 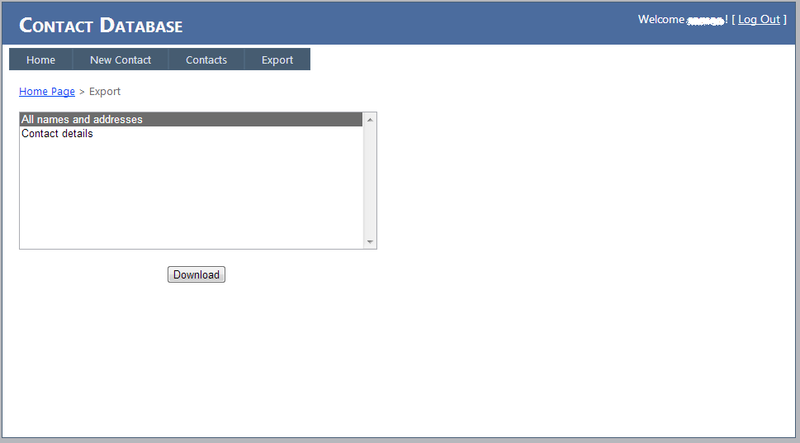 Each security role defined in the folder has a set of settings you can see under Users. I clicked href Users. That’s why we are viewing the settings for this role. As you can see Users have all permissions in new folders by default. Note that if a role is not in the role list, it doesn’t have access to the folders at all. So our new roles don’t have any permissions in the folder we look at but don’t forget that our users are members of the Users role. That’s why they can do eveyithing at the moment. In the root folder our team is going to store annual leave requests and equipment requests. These document types are useful for everybody. Therefore the rule is that everybody can create a document in this folder. People can also read documents of their collegues in the folder because we need them to plan vacations together. We don’t want to give access to equipment requests, but we’ll talk about that later because I am going to configure that in the document type permissions specifically for equipment requests. So the settings for the role Users in the Documents folder will be as in the figure 6.
see the folder on the list of folders (Browse). However, it is not applicable to the root folder because it’s never on the list of folders. You are always within in. delete documents (Delete) including their own (Delete own). The reason why we don’t allow the users to delete their own documents is because we want to guaranty that no annual leave request was deleted by a malicious employee. It’s time to configure a role that is responsible for these documents and has more permissions. They are Managers. We add the role to the list and set the settings (see figure 7). These settings say that Managers can do everything in the folder. In fact they update when they accept request or reject it. They might delete document if it’s no longer needed. You got the idea of the folder security configuration. Next thing we have to do is to create the document types equipment requests and annual leave requests. We need to go to Folders/DocumentTypes and click Create document type. 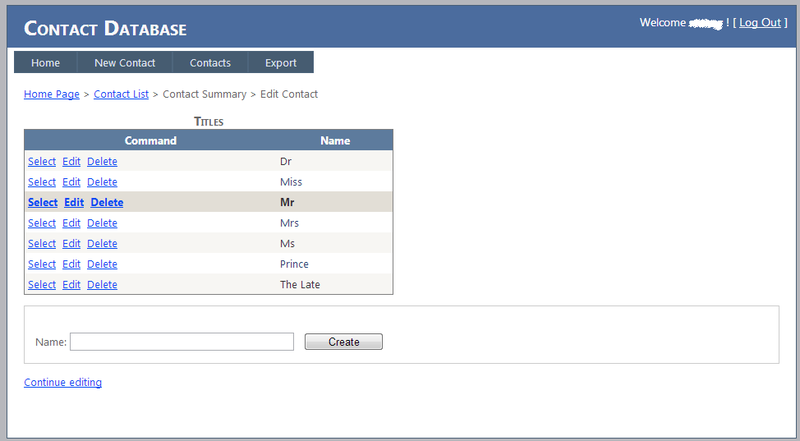 The first tab of the document type form for equipment requests you can see in Figure 8. Note Prefix and Next number fields. Each document has a unique number. When you create the first document of this type, its number is going to be EQ00001. After that the next document of this type is going to be EQ00002 etc. Next we fill in the route tab. … the docs end here, I got bored of writing these and haven’t touched these since then. Let me know if you are interested in the continuation. The installation is easy because the application comes with a lightweight web server. All you need is run the installer and find the “EVPO Document Circulation” shortcut in your Start/All Programs. You also need a running instance of MySql server. You can install it after this installer. MySql Server needs to be available in your network and you need its machine name and the port number (if not default). Windows machine with .NET Framework 2.0. When you run the shortcut, the configuration wizard will start. When the configuration is finished, the same short cut will be opening the application normally (picture 1). The system needs administrative access to the MySql database server to create its database and two accounts. The wizard doesn’t create or modify anything at this step yet. However, it checks the access to the database server. In step 2 you will be asked the name of the database. If you install the application for the second time and already have the database, only enter its name and untick “Create new database”. If you don’t, your existing database will be lost as it says on the page. In step 3 of the wizard two accounts will be created in MySql server. EVPO DC will use them to access the database. You don’t need to remember the passwords. They will be written to the application configuration files later (Warning: they will be in the config file in plain text). Step 4 (see picture 3): The web application needs permissions to write in that directory. The ASP.NET account set by default cannot modify files in directories. This is not the case when you use the installer. The server is run in Utildev cassini web server. It uses the NT AUTHORITY\SYSTEM account that have all the necessary permissions. Click next. The directory will be created. Most accounts require SSL. Google Main is one of them. In step 6 (Picture 5) the wizard will save everything you have entered to the specified configuration file (evpodc.config) (Warning: all entered information and passwords will be in the file in plain text). My interests are C++, Linux, .NET and algorithms. I write about awesome things that surprised me or I want to document something useful for me and others. I am also a maintainer and developer of EncryptPad project – open source application for editing symmetrically encrypted text in OpenPGP format and also a tool for encrypting binary files on disk.